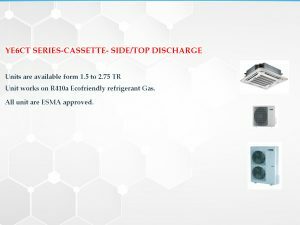 YE6CT SERIES-CASSETTE- SIDE/TOP DISCHARGE Units are available form 1.5 to 2.75 TR Unit works on R410a Ecofriendly refrigerant Gas. All unit are ESMA approved. 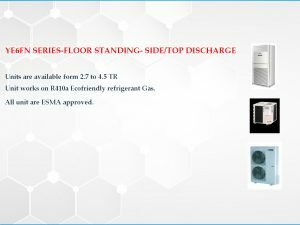 YE6FN SERIES-FLOOR STANDING- SIDE/TOP DISCHARGE Units are available form 2.7 to 4.5 TR Unit works on R410a Ecofriendly refrigerant Gas. All unit are ESMA approved. 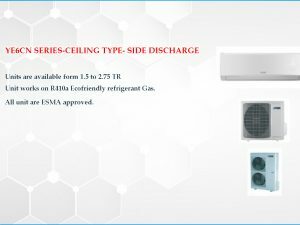 YE6CN SERIES-CEILING TYPE- SIDE DISCHARGE Units are available form 1.5 to 2.75 TR Unit works on R410a Ecofriendly refrigerant Gas. All unit are ESMA approved. 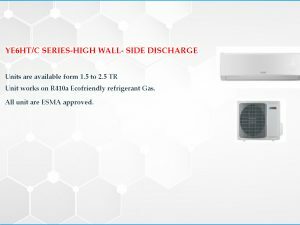 YE6HT/C SERIES-HIGH WALL- SIDE DISCHARGE Units are available form 1.5 to 2.5 TR Unit works on R410a Ecofriendly refrigerant Gas. All unit are ESMA approved.